Happy #FrenchFriday and welcome to your weekly French beauty rendez-vous! 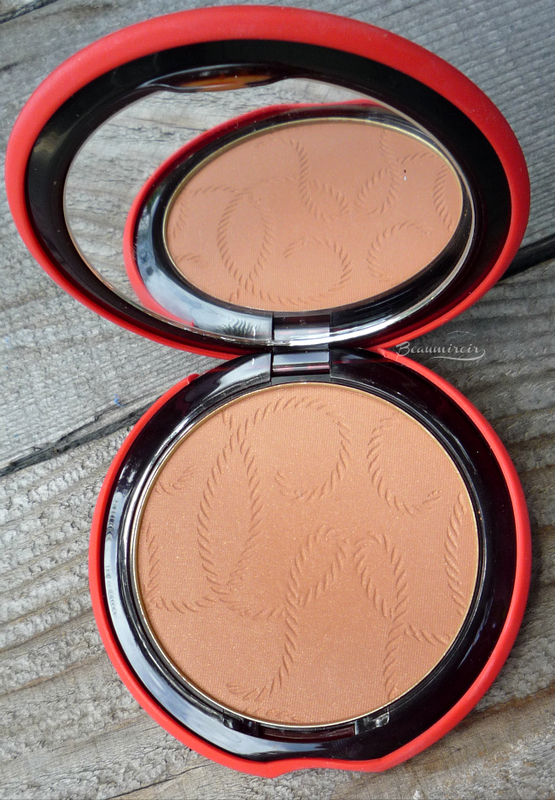 This week we'll talk about THE cult French summer makeup product, the iconic Guerlain Terracotta. Nothing evokes a hot August afternoon spent strolling on the Promenade des Anglais in Nice like Guerlain's best-selling bronzing powder. If you want a sunkissed cheek, but with an elegant, high-end twist, this is just what you need. Terracotta means "baked earth" and the word is used to describe a type of clay-based ceramic, and by extension a burnt orange or reddish brown color. It's a red earth found in the Moroccan desert that inspired the creation of Guerlain's Terracotta bronzer in 1984 by Dominique Szabo, then Creative Director for makeup for the brand. What was revolutionary at the time was the natural, sheer effect, so different from the heavy brown blushes and orange-based foundations used in the early 80s. The Terracotta's success grew in the 90s, when people started realizing the dangers of excess exposure to the sun and UV tanning beds, but didn't want to give up the bronzed look. "No sun, no problem" was then the main selling point. The Terracotta is still Guerlain's best-seller, with one compact sold worldwide every 20 seconds, and it now comes in many different variations, together with a whole collection of complementing products launched every summer - such as the bronzing water Eau Hâlée this year. 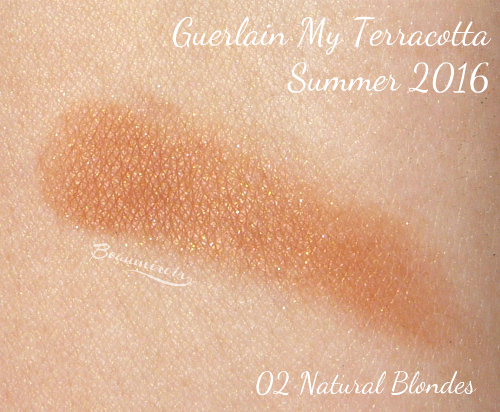 For a few years now Guerlain has started releasing one of their permanent shades of Terracotta in a limited edition version just before summer, and this is what I'm going to show you today: My Terracotta Limited Edition 2016, featuring shade 02 Natural Blondes. 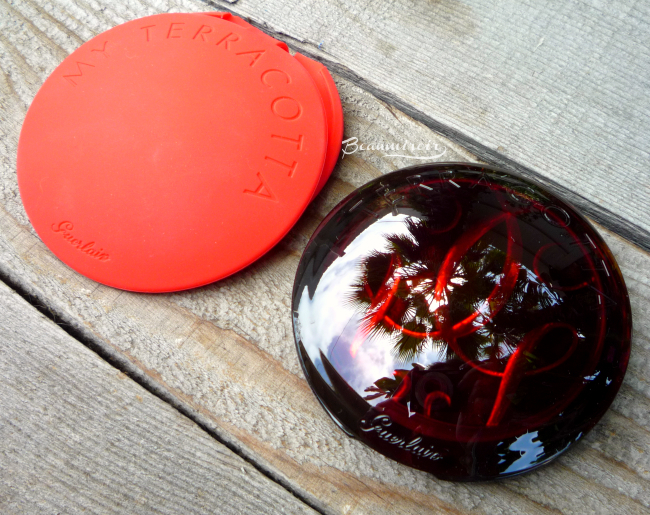 The compact itself is the classic caramel-hued packaging with smooth, curvy lines all permanent Terracotta powders come in, but it's covered in a soft, removable red rubber sleeve embossed with Guerlain's signature and the words "My Terracotta". This cover is great for protecting the compact if you travel a lot, but it has a tendency to slide off. 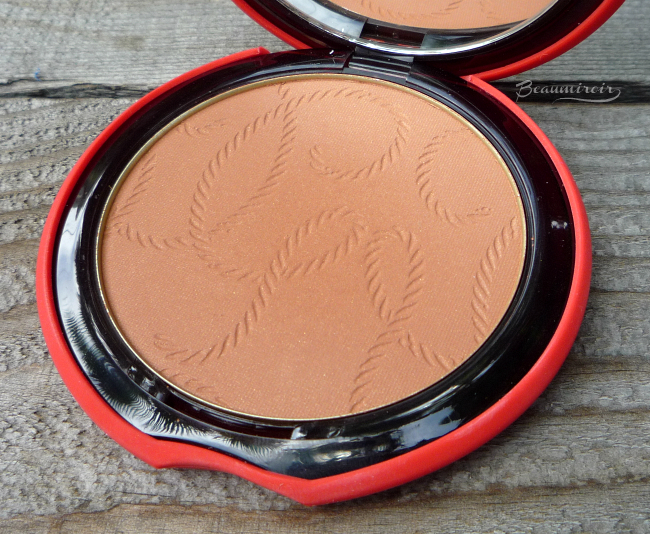 Another thing that makes this limited edition unique is the nautical rope pattern embossed on the surface of the powder, in the shape of Guerlain's G logo. Shade 02 Natural Blondes, as I said, is part of the permanent range. In the pan it looks like a medium brown with burnt orange undertones, and in direct sunlight it seems to have a strong golden shimmer. Nothing to worry about though, this micro-shimmer is ultra-fine and doesn't translate to visible shimmer on the skin once applied with a brush. Instead, it contributes to the Terracotta's gorgeous natural sheen. 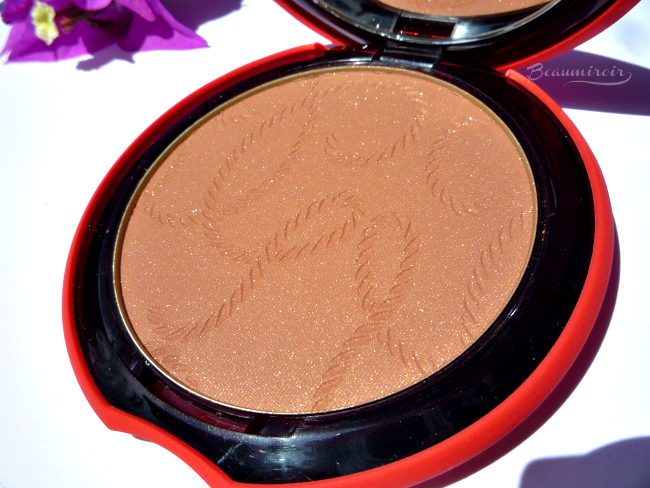 The shade is decidedly very warm, on the orange-y side of the bronzer spectrum - not in a clownish, carrot-like way like your typical 90s drugstore bronzer, but I'm not sure this color would suit people with cool undertones. If that's your case, check out some of the other shades in the range. On my neutral to warm skintone it looks like a natural sunkissed tan in the warm light of a late summer afternoon. 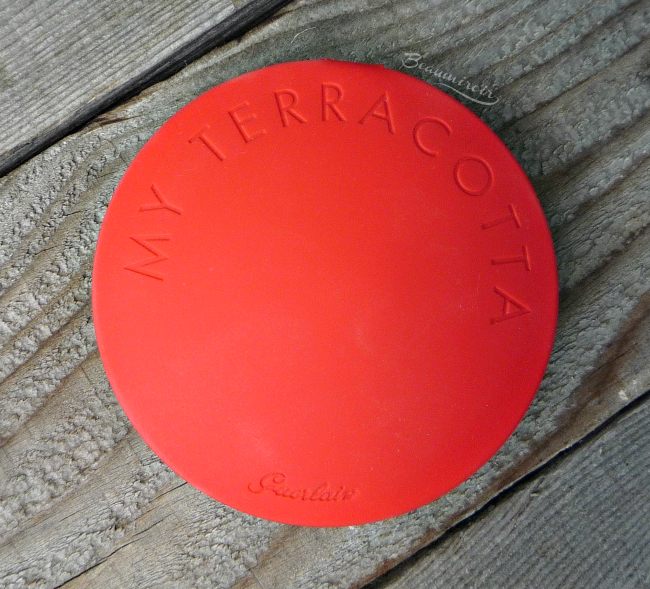 The Terracotta is incredibly finely milled, thin and soft to the touch. There's no excess powder kicked out when you swirl your brush in the compact, and it never looks or feel powdery on the skin. The texture is absolutely imperceptible, I mean, I'm not even sure it should be called a powder! Truly a luxury experience. It's also supposed to have hydrating ingredients to keep the skin healthy. I would describe the pigmentation as medium, with a sheer result in one swipe, but it's easily buildable should you wish a stronger tan. You can also apply it very lightly if you prefer, and no matter how heavy-handed you are, it blends like a dream. I over-applied a few times just to see how it would look, and blending it back to a flattering result was very easy with a large powder brush. 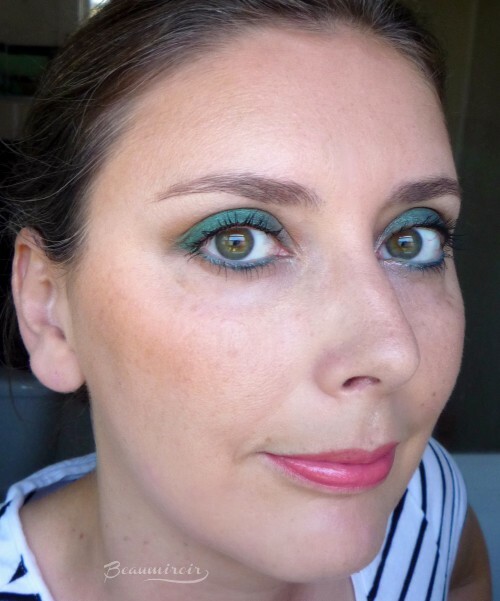 There's no risk of getting sharp edges or the dreaded bronzer stripe with the Terracotta! You can use the classic bronzer technique where you draw a number 3 on your face with a fluffy domed brush, starting along the hair line, going around the temple and over your cheek bone, back to the temple and along the ear to finish just under the jawline. 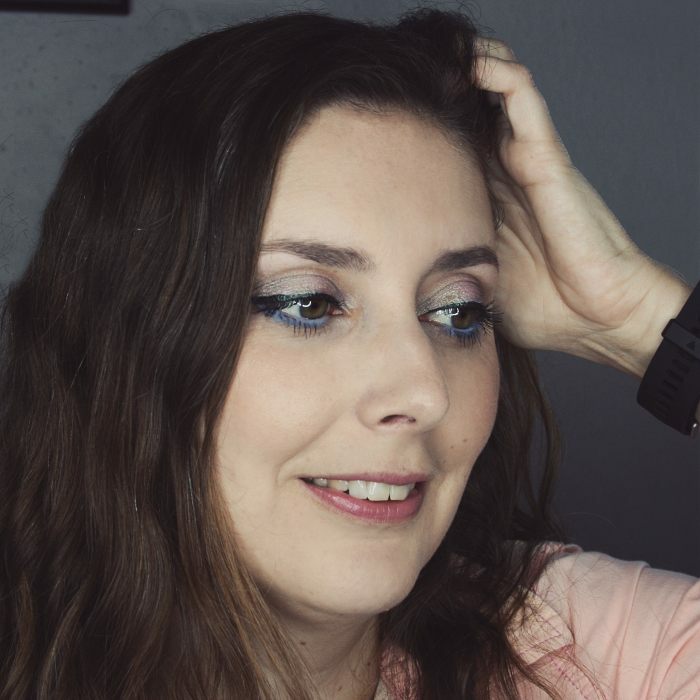 I also learned that there's a "G" technique specific to Guerlain: you trace a G on your face starting on your temple, then going towards the center of the forehead following the hair line, down your nose to your chin, around your jaw and up towards your hear, and then horizontally on your cheekbone. This particular shade is not made to contour, since it's very warm. The result is very fresh, it looks like my own skin but with a warm tan and a little bit of a healthy glow to it. Like I said earlier it doesn't look shimmery on the skin, but it has a very nice sheen that looks completely natural. You know how matte bronzers can end up looking a bit muddy? Well Terracotta definitely doesn't, and I'm sure the skin-like sheen is the main reason for that. It also does this weird thing were it seems to blend in with my foundation or my bare skin within the first 30 minutes after application: it's hard to explain, but it looks a bit more diffused after a while. Not that it travels all over my face, it just looks softer and more blended after everything has had some time to set. The Terracotta scent has its fanatics, and Guerlain even launched it as a bottled fragrance in 2014 to celebrate the 30-year anniversary of the bronzing powder creation. I personally enjoy this warm, sensual floral scent, but be warned: this is a very strongly fragranced product. 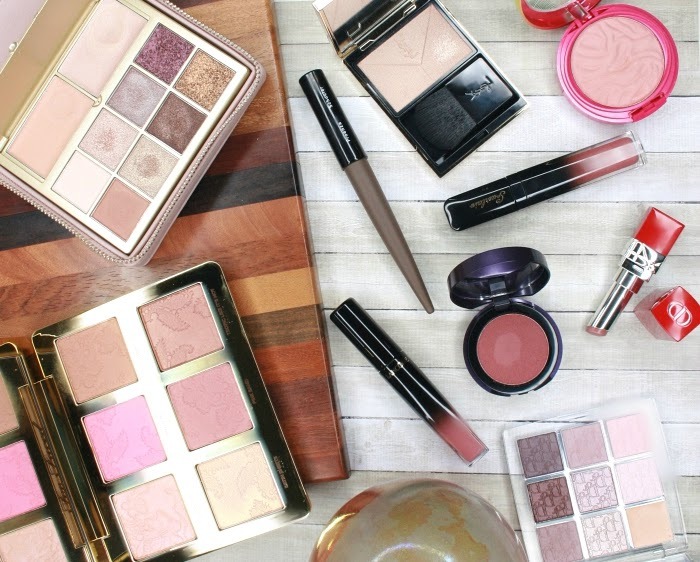 If you prefer your makeup fragrance-free, this is really not for you! If my compact is open I can smell it from the other side of the room. The only downside of this My Terracotta Summer 2016 edition for me is that it doesn't last all day. It's noticeably faded after 5 or 6 hours of wear. In the summer my skin is oilier and also gets sweaty, so I might get a better performance in the cooler season. You could also use a makeup setting spray to prolong the wear (consider Coola for its SPF!). With Guerlain's Terracotta bronzing powder you can experience French luxury for "only" around $50: beautiful packaging, exceptional texture that yields a natural, flattering result, enticing scent, everything is carefully crafted to ensure that you enjoy every aspect of it. 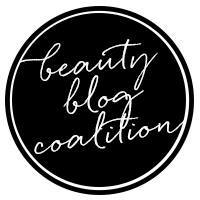 It's really like no other, and I'm so glad I indulged: I just feel a little more glamorous every time I use it! 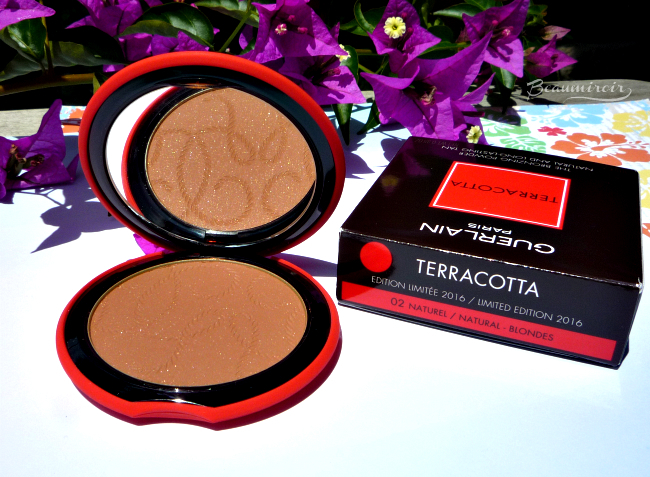 Have you ever tried Guerlain's Terracotta?